Graduating seniors in NIU’s College of Engineering and Engineering Technology (CEET) showcased how their creations can help improve lives as they presented their final projects at the college’s fall 2018 Senior Design Day. Each semester, seniors within CEET form teams and compete in the college-wide competition. The students draw upon years of instruction in NIU’s engineering program to create projects that aim to improve upon real-life problems. In the end, they developed something tangible that shows the culmination of work they have been doing throughout their time at NIU. “It was a very surreal moment to stand up there knowing that all of the course work, labs, internships, co-op sessions, valuable input from CEET professors and a lot of hard work came together into the design we were presenting,” said Daniel Graunke, who was part of the winning design team in the electrical engineering category. Some teams had to meet challenges for specific clients, such as creating a renewable energy source for the Glidden Museum or improving the assembly line at SPX Flow, while others developed their own ideas to improve everything from theaters in Chicago to sewer lines beneath cities. A team of faculty representatives from each department selected winners within each department. Then, alumni from the Engineering and Technology Alumni Society selected an overall winner, said Professor Abul Azad. This year, the overall winning project was a motorized assisted walker, which helps those who are unable to walk property. It was an interdisciplinary effort between students from both the mechanical and electrical engineering departments. The team, made up of Fahad Mohammedhussein, Mary Carter, Mark Pacyga, William Dedic, Michael Bockwoldt, Michael Duda, Hnin Lin, Matthew Martone, Jazael Medina and Nathan Luptak, came up with a project that would lift an individual from sitting to standing and promote muscle rehabilitation. It allows the user to control the wheels from a joystick, and also uses a sensor to stop them from colliding with another object when it gets too close. The individual winner in the electrical engineering category, Graunke’s project created an inexpensive 3D electromagnetic stylus. His group’s goal was to fill the market gap for an easy-to-work-with tool that would create digital free-form 3D sketches drawn directly into a 3D space for under $100, he said. He said STEM programs in schools are a great real-world application for this project, because the easy-to-use design can help cultivate depth perception and 3D visualization skills, which help students succeed in STEM fields. While still a work in progress, when the group unveiled what they created, the room of students, faculty and spectators gasped. Graunke said it was a proud moment. “It was an awesome experience to present the project on Senior Design Day,” he said. “We had spent a lot of time and effort testing and troubleshooting the week leading up to the presentation, and we were not sure if our project would fully work until the morning before the presentation. “My teammate, James Shulgan, made something of a miracle happen with the software, and it was a very proud moment for all of us to be able to present a working prototype,” he said. 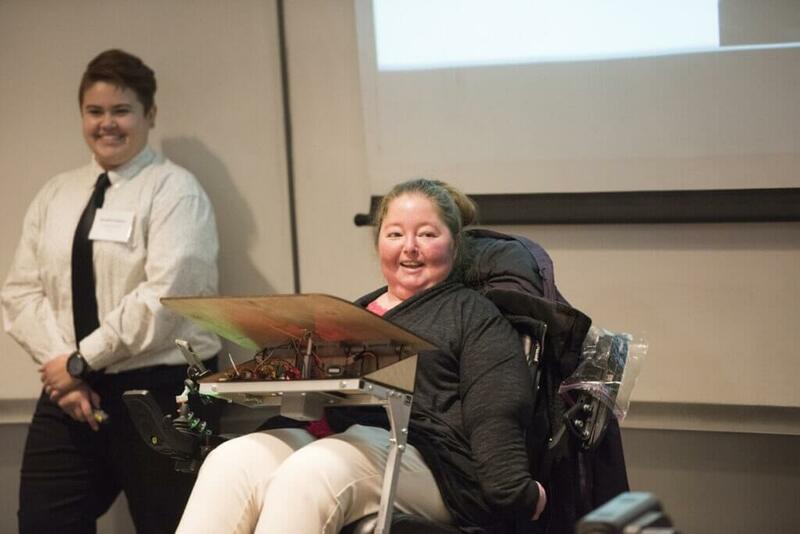 The runner up to the stylus in electrical engineering created a system that allows a disabled high school student to communicate with her peers. It translates her sign language movements into letters and words, helping her to integrate even more into the student population. Tasked with a challenge dubbed “Freedom Project” that would similarly help an individual, students in the mechanical engineering department custom fit a wheelchair to help a woman suffering from cerebral palsy gain more freedom. With the new design, she gained a balancing wheelchair table top that won’t spill its contents, easy access to her cell phone and a compartment that keeps her personal items close by. Previously, she was having difficulty with the table tilting and items falling. Students made it easier for her to adjust, and ultimately easier for her to have access to all she needs. “With the turn of a knob, she can set the table to any height she needs,” said David Williams, one of the students who worked on the project. Also helping people with difficulty getting around, the winning project in the Technology Department was an electronic assisted knee walker. The design from Farhan Alghamdi, Arturo Avila, Isaias Cervantes and Stephen Salger has three wheels for increased stability for people using knee walkers. It also has a motor to help move users uphill, ultrasonic detectors on the front to alert the users if hazards are in the way and tilt sensors to alert the users if it might possibly tip. Targeting a completely different need, the winning design in the Mechanical Engineering Department called “Shadow Track,” aimed to improve upon the way spotlights in theaters are controlled. Presently, many are operated manually in uncomfortable and often unsafe conditions, the students said. Shadow Track is an autonomous light system using an infrared sensor that provides a reliable, safe, accurate and low-cost way to follow a presenter on stage, they said. The system can direct the spotlight to the target position in 1.02 seconds, faster than human control. “They brilliantly caught what people actually need in the field and conducted a complete project in that they delivered a perfectly working prototype,” said Professor Ji-Chul Ryu, the winning project’s advisor. Ryu said developing a project such as Shadow Track, and all of the other projects showcased at design day, not only helps these graduating seniors as they head into the workforce, but they also can help solve real-life problems that impact many. “In my opinion, it’s like a reward process in which students convert what they have learned from the program into something that actually works that could benefit our industry and eventually society,” Ryu said.